Treat the ask with importance. You how know when you meet someone you like you don’t ask them to be your significant other right away? 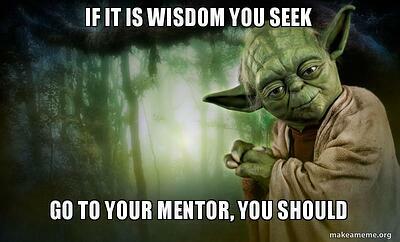 Mentorship is like that. It’s a good idea to treat the ask as a moment to work up to and not something you blurt out right away. Try building your relationship informally first, whether it’s chatting at an event or stopping by their office and work up to the ask. Lay out what you’re hoping for. Tell them why you want them. Let them know their professional life mirrors your desired career path and you really want to learn from them. It never hurts to play up mutual interests or hobbies too! Be respectful of any response. Don’t take it personally if someone doesn’t want to be your mentor. They could have a little too much going on in their personal and/or professional life to give you the attention you deserve right now. Thank them for their time and set your sights on someone else. Taking initiative. Have goals in mind and help cultivate the relationship. Be clear with your mentor about the type of advice you’re seeking, questions you have, and support you’re requesting. Make sure you actually attend suggested events, make connections, or tag along to meetings you’re invited to. Keeping an open mind. Your mentor is going to give you a lot of feedback, likely both positive and constructive. We all know feedback isn’t easy, so make sure you’re receptive to what they’re saying and take it into consideration. You don’t have to treat them as an all-knowing entity, but make sure you at least listen to and evaluate what they’re saying. Being enjoyable to mentor. Your mentor is doing you a favor by taking the time to help you grow professionally. Make sure you’re thankful for their help and are eager to learn from them. They’ll want to help you even more when they see your positivity! Finally, remember to pay it forward. One day the mentee will become the mentor and you will have the opportunity to help the next group of young professionals to build their mentoring relationships.